We live in a country that loves greatness and that is a good thing, for God has made us to be inspired by what is beautiful and noble and exalted. As Christians we prize and love great preachers. What a blessing God has given us through the preaching of John Piper, Tim Keller, Alistair Begg, John McArthur, Matt Chandler and many more. Their passion and fervency for the Word of God have inspired many to give themselves to Christ and to devote themselves to the Scriptures. Many have “welcomed the message with eagerness and examined the Scriptures daily to see if these things were so” (Acts 17:11). The danger is that we will become man-centered instead of Word-centered, so that we prize the preacher more than what is preached. This is what happened in Corinth, and people claimed to be disciples of Paul, Apollos and Peter (1 Cor 1:12). They forgot that “the message of the cross is foolishness to those who are perishing” (1 Cor 1:18). The Corinthians became entranced with the rhetoric and speaking ability of the various preachers. They were wowed by their presentation and by the messengers instead of their message. Paul feared they would trust him rather than the gospel (1 Cor 2:3), and hence vowed “to know nothing among you except Jesus Christ and him crucified” (1 Cor 2:2). His “speech and proclamation were not with persuasive words of wisdom but with a powerful demonstration by the Spirit” (1 Cor 2:4). Paul preached in such a way that the focus was on Christ, the truth of God’s Word and the gospel rather than on himself. There are two important observation that must be made so that what I say isn’t misunderstood. First, Paul is not saying that preachers should try to be boring and uninspiring. He is not criticizing rhetorical ability, per se. Gifted orators and preachers are given for the edification and good of the church. Preachers should work on making their messages better so that they can communicate clearly and powerfully the gospel of Christ. We have no excuse here for laziness and sloppiness. Second, the problem in Corinth was not with Paul or Peter or Apollos. These ministers of the Word were not trying to attract a following. They were not advocating or advertising themselves. They did not name their churches “Apollos Baptist Church” or “Paul Baptist Church.” Remarkably, the fault was with the Corinthians themselves. They wrongly and mistakenly exalted Peter, Paul and Apollos, and they did so because of their own pride and arrogance (1 Cor 1:29, 31). They selected their favorite preacher to promote their own “wisdom” and spiritual insight. They sided with one preacher over another in order to exalt themselves instead of exalting the Lord. How subtle the Christian life is, for that which God has given to us for our good may be used to advance ourselves so that we get the glory rather than God. The implication for today is also clear. We should not blame gifted preachers of today if some follow them in a cult-like manner. As long as such preachers proclaim the priority of the Word of God and exhort their hearers to follow the Word rather than themselves, the fault lies with their hearers if they elevate them to spiritual heights. What can we do in our churches to cultivate a Word-centered rather than a man-centered ministry? First, preaching should be mainly expository rather than topical. Preaching in an expository manner means that we preach through books of Scripture verse by verse. Now topical preaching is helpful as well, and having some topical series can benefit a congregation. But the focus should be on expository preaching, for then the Scriptures themselves set the agenda for what we proclaim rather than our own imaginations. The congregation clearly sees as we work through book after book that we are appealing to the Scripture as the authority, that the Word of God has the final say on all matters of faith and practice. Second, our preaching should be clear and understandable. If we are too clever and imaginative in our preaching, our hearers may be wowed by us instead of the Word of God. Typically, our hearers should be able to see what we proclaimed from the Scriptures when they read it carefully themselves. Our preaching should unpack and communicate what is found in the Scriptures. If our hearers are astonished regularly because of our “amazing insights” and can’t find those truths themselves in the passage preached, we are in danger of forming a cult of personality, so that the congregation begins to place trust in the preacher rather than the Word. Creativity and imagination are gifts of God, but we must be careful, for they can be loosed from the Word of God so that the focus shines on the preacher instead of what is preached. Third, if at all possible (and it isn’t always possible), we should share preaching duties. In other words, we should not be the only preacher in our church. It is helpful for a church to have several men proclaim the Word of God. By doing this, we teach the congregation that it is the ministry of the Word rather than a ministry of the preacher. If several men preach, the congregation learns that the authority is in the word of truth and not in the person. Congregations, it is hoped, will learn through various preachers that expository preaching manifests itself in different ways through various personalities. 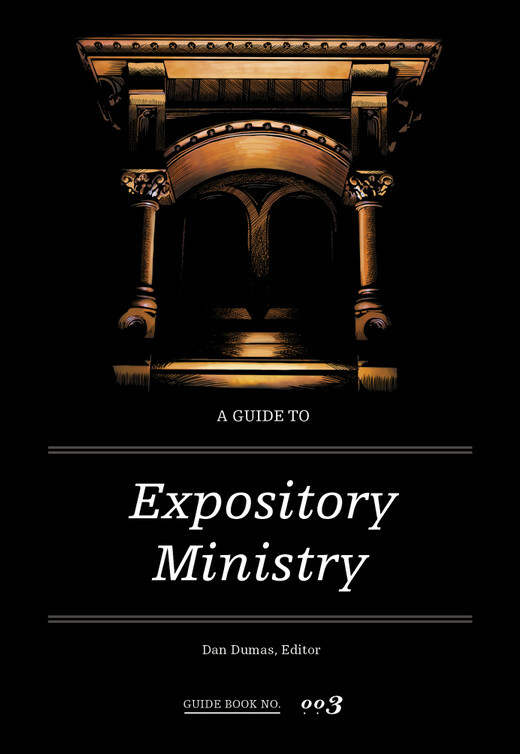 If the pulpit is shared (even if one person does the bulk of the preaching), the congregation is prepared to some extent for the day when a new pastor commences his ministry. They have been taught regularly by a number of preachers and have learned that the authority lies in the Word instead of the person proclaiming it, and thus the glory belongs entirely to God instead of to us.